Lowdown: The anime series Star Blazers receives a live action treatment. I won’t bore you with things I have already said in my review to the anime feature film Farewell to Space Battleship Yamato. Suffice to say that Star Blazers, the English series interpretation of the same anime affair, was a childhood cornerstone of mine which I still hold dear. To my surprise, I had recently learned that there is a 2010 live action version ***of the same series***. I guess there is something to be said about the relative feasibility of a modern day computer special effects. Clearly, I had to watch it. I had to watch Space Battleship Yamato. The most glaringly obvious thing about Space Battleship Yamato is just how loyal it is to the original anime. The characters are the same, the plot is essentially the same (although, when compared with the series, it was obviously condensed into one 2 hour long episode), the costumes are the same, the weapons are the same, the look and feel is the same. Someone went to great lengths there! Sure, there are some differences (I don’t see the point in mentioning them here), but in the grand scheme of things they are truly negligible. The story takes place in a space age future where an alien race (here subtitled as Gamelas, originally Gamelons) bombards the earth with radiation bombs and thus drives the remaining population underground. That offers only temporary relief; the human race has a year, at most, before radiation takes over the joint. And it’s not like we’re doing well militarily: in the decisive battle, with which the movie starts, we’re pretty much wiped out. Hope still lives in a message found by Kodai (aka Derek Wildstar). According to the message, the solution to earth’s problems is available on the planet Iskandar, lying somewhere in the Magellan Cloud. Luckily for us humans, the message includes info on engine technology that can allow humans to make it there and back within a year. Now all hope lies with the Yamato, earth’s last remaining space battleship, and its volunteer crew. Can it make it there and back? Not if the Gamelas can help it. Once I was able to overcome my appreciation to the fidelity of this Star Blazers manifestation I could not avoid noting how Japanese this movie is. That is, how weird the people in it act: they constantly shout at one another, and they seem OK with it. 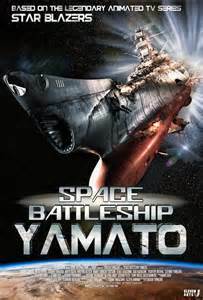 I guess it goes with Space Battleship Yamato being a military movie, as well as the dark themes it involves (it follows similar lines to film Farewell to Space Battleship Yamato, rather than the optimistic affair that was Star Blazers). That, however, does not excuse weirdness; I still blame Japan with that. The final nail on the coffin has to come from the oh so pathetic treatment of the romantic subplot. Talking of the Japan factor. One thing I am aware of today, which I was completely unaware of as a child, is the existence of a real Battleship Yamato. If you read your Wikipedia you will learn the Yamato was the biggest ever battleship and Japan’s pretty much last attempt to turn the tide of World War 2. It did not work, but – when one sits to watch Space Battleship Yamato – one has to wonder what the movie is trying to say to its native Japanese audience. There is no mistaking the link, because the movie’s Yamato looks exactly like the WW2 weapon. Whichever way you look at it, I doubt you’d come back with stuff that makes you feel warm and fuzzy. This is nationalistic stuff, through and through. Overall: Not the best movie ever, but if you’re a Star Blazer then dare not miss it. 3 out of 5 nationalistic/militarist crabs.